1. Gangsa is a single hand-held smooth-surfaced gong with a narrow rim. 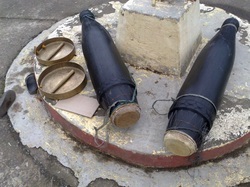 A set of gangsa, which is played one gong per musician, consists of gangsa tuned to different notes, depending on regional or local cultural preferences. 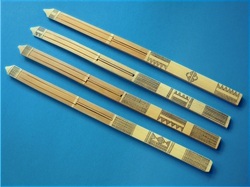 The number of gangsa in a set varies with availability, and depends on the tradition of a particular ethnic group of the Luzon Cordillera: Kalinga, Ifugao, Bontoc, etc.Among the Kalinga people in the Cordillera region of Luzon Island, the gangsa is played in two ways. One way is called "toppaya" and the other is called "pattung." 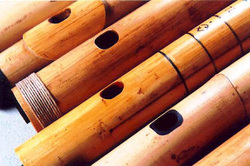 In "toppaya" style, the musicians play the surface of the gangsa with their hand while in a sitting position, with a single gangsa resting on the lap of each musician. 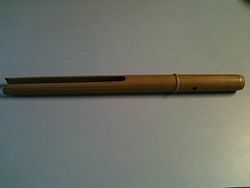 In the "pattung" style, a gangsa is suspended from the musician's left hand and played with a padded stick held in the musician's right hand. 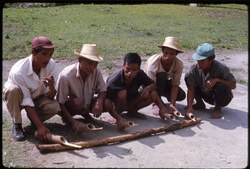 In the "pattung" style of playing, the players are standing, or they keep in step with the dancers while bending forward slightly. 6. 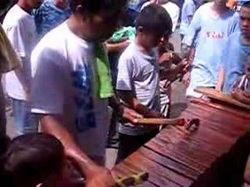 Solibao is hallow wooden Igorot drug topped with pig skin or lizard skin this is played by striking the drum head using the palm of the hand.